Naturally occurring chemicals in groundwater that is used for irrigation can leave chemical precipitates in emitters, such as calcium carbonate (lime), iron and manganese compounds, and iron sulfide. Calcium carbonate will precipitate when the bicarbonate concentration exceeds about 2 meq/l (milliequivalents per liter) and the pH is greater than 7.5. Increasing temperatures decrease the solubility of calcium carbonate, increasing the potential for precipitation. Iron exists naturally in groundwater as soluble iron. When you pump the water, the soluble iron can change to an insoluble form and, as a result, the iron precipitates out of the water. Iron bacteria in a well can also cause insoluble iron to form. Reactions similar to those that cause iron precipitation also cause manganese to precipitate. Iron precipitate clogging is generally not so common a problem as lime (calcium carbonate) precipitate clogging, but where it does occur it is a difficult problem to mitigate. 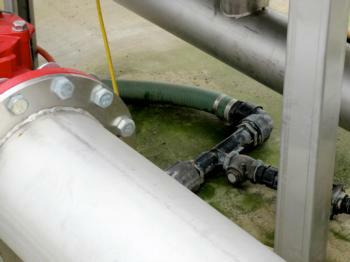 In addition to the precipitation of natural chemicals, fertigation (the injection of fertilizer into irrigation water) can cause precipitates in the water that can clog emitters. Injecting fertilizers or soil amendments that contain calcium can cause calcium carbonate precipitation and using fertilizers that contain phosphate can cause calcium phosphate precipitation. Injected chemicals may also be incompatible with each other or other constituents within a water source, leading to chemical precipitation.